In What Does the Human Lack the Expression of Neu5Gc? Akemi Suzuki was born in Fukushima in 1947 and graduated from Shinshu University School of Medicine. He obtained his D. Med. Sci. degree from the University of Tokyo. He started his career working on glycolipid biochemistry in Prof. Tamio Yamakawas laboratory. He was awarded the Ernst Klenk Award and studied immunology in the lab of Prof. Donald Marcus at the Albert Einstein College of Medicine from 1978 to 1980. He returned to work in Department of Biochemistry, University of Tokyo, and started research on glycolipid genetics using mice. His research interests include regulation of glycolipid expression and microdomain formation and functions supported by glycolipids and membrane-bound functional glycoproteins. Dr. Suzuki moved from the Tokyo Metropolitan Institute of Medical Science in 1999 to work on RIKEN Frontier System. He is now Group Director, Supra-biomolecular System Research Group, RIKEN Frontier Research System. He received the Japanese Biochemical Society Award in 1985 and the Inoue Prize for Basic Science in 1990. On January 4, 2002, Asahi Shimbun published two stories on the front page. One reported on the difference in genomic sequences between human and chimpanzee. The difference is 1.23%. The other described the successful production of cloned pigs lacking expression of the Galα1-3Gal epitope. This article is a brief exploration of how these two topics are related to the subject, Sialic acid and human evolution. The history of sialic acid is an interesting human one1. Gunnar Blix in Uppsala isolated crystals from bovine submaxillary mucin on heating in water in 1936. He later named this substance sialic acid according to its acidic nature and source material. In 1940, Ernst Klenk in Cologne also crystallized a substance obtained from diluted acid-hydrolyzed material of acidic glycolipid purified from the brain of patients with Tay-Sachs disease, which is now known to be an inborn error of metabolism due to genetic mutations in β-hexosaminidase-related genes. Klenk named this crystallized substance neuraminic acid according to its acidic nature and source tissue, neural tissue. Structural determination had been done extensively by many investigators including Blix, Klenk, and Richard Kuhn in Heidelberg, Tamio Yamakawa in Tokyo, Alfred Gottschalk in Canberra, and Noboru Hiyama in Sendai. Various structures were proposed and finally the correct structure shown in Fig. 1 was reported by Gottschalk. A very short note published in Nature, 19572, informed readers that Blix, Klenk and Gottschalk had reached an agreement on the nomenclature of the substance, i.e. sialic acid as the family name for the substances having a core structure called neuraminic acid. Since then Schauer and colleagues in Kiel studied extensively the structures of naturally occurring neuraminic acid derivatives, and so far over 30 molecules of sialic acid family have been found3. In terms of the distribution of sialic acid in mammals, interesting data have been accumulated. The porcine submaxillary mucin contained N-glycolylneuraminic acid (Neu5Gc). The sialic acid of human brain glycolipids was exclusively N-acetylneuraminic acid (Neu5Ac). The sialic acid of a glycolipid isolated from horse erythrocytes by Yamakawa was Neu5Gc. These and other results indicated that Neu5Gc is distributed in a species-specific manner and that the human species appears to be unique among mammals in terms of the lack of Neu5Gc in normal tissues. Fig. 1　Structures of Neu5Ac and Neu5Gc. The treatment of serious infections such as diphtheria and tetanus before the discovery of antibiotics was the injection of antisera produced by immunization with bacterial antigens in large mammals like horse, sheep, and goat. However, it was known that a second injection to patients produced serious anaphylactic responses at a high rate. The cause of this was considered to be due to the production of heterophile or xenogenic antibodies against some foreign materials present in injected antisera, and this antibody was named HD antibody after the Czech investigators, Hanganutziu and Deicher, who found and reported this. Naiki in Japan and Milgrom in the U.S. discovered that one of the heterophile antigens was Neu5Gc-containing glycoconjugates. These lines of evidence indicate that the production of HD antibody is a secondary immune response and that humans do not carry the antibody without artificial stimulation by the antigen, Neu5Gc. The immunogenicity of Nue5Gc to human is very different from Galα1-3Gal epitope because the human carries anti-Galα1-3Gal but not anti-Neu5Gc antibody as natural antibodies. Pig organs if transplanted into human are rejected immediately by the natural anti-Galα1-3Gal antibody. Therefore the production of deletion mutants of Galα1-3Gal epitope is essential for xenotransplantation of pig organs. Then, the deletion of Neu5Gc expression would be required in order to maintain the transplanted organs, and this is one of the next targets in the development of xenotransplanation, if immunosuppressive drugs cannot control the antibody production to Neu5Gc. Roseman established that Neu5Ac is produced from N-acetylmannosamine and pyruvate by a bacterial enzyme4. A mammalian synthase produces N-acetyneuraminic acid-9-phosphate from N-acetylmannosamine-6-phosphate and phosphoenolpyruvate. Schauers group investigated the biosynthesis of Neu5Gc and found that hydroxylation is the rate-limiting reaction and takes place on cytidine monophospho-Neu5Ac but not on free Neu5Ac5. The purification of enzymes responsible for the hydroxylation had not been successful until we found that the hydroxylation of CMP-Neu5Ac is a complex reaction carried out by multiple enzymes and not by a single enzyme. Kozutsumi in my laboratory noticed that the separation of cytosolic proteins of mouse liver by ion-exchange chromatography with gradient elution and fractionation did not give hydroxylation activity in every fraction, and he supposed that this might happen due to the separation of several factors into different fractions. He proved that this was the case by a mix experiment. Two fractions were required for the enzyme activity, and one fraction was replaced by cytochrome b56. Thus, we were able to propose the scheme of the hydroxylation reaction, i.e. the hydroxylation of CMP-Neu5Ac is carried out by hydroxylase, cytochrome b5, and NADH-dependent cytochrome b5 reductase (Fig. 2). We then assumed the critical net step to be the purification of the hydroxylase. This was examined by a combination of several chromatographies including affinity chromatography7. One interesting property of the enzyme is that the hydroxylase can bind a cytochrome b5-immobilized column only when CMP-Neu5Ac is present in the application and washing buffers, demonstrating that the hydroxylase binds to the substrate, CMP-Neu5Ac, changes conformation, and exposes the binding site to cytochrome b5 (Fig. 3). The hydroxylase was successfully purified and the amino acid sequences of several peptides prepared from the enzyme were obtained. Based on the amino acid sequences, mouse liver cDNA was cloned and sequenced8. Fig. 3　A scheme of the conformational change of the hydroxylase. The hydroxylase changes its conformation in the presence of CMP-Neu5Ac substrate and creates the binding site of cytochrome b5. 5. In What Way Does the Human Lack the Expression of Neu5Gc? As noted above, normal human tissues do not contain Neu5Gc as a monosaccharide of glycan chains of glycoproteins and glycolipids. This is supported by many papers dealing with the structural analysis of glycan chains isolated from normal human tissues. Another important finding is that Neu5Gc is antigenic to human, as also mentioned above. We focused on answering the question why human cannot produce Neu5Gc and concluded that the most important experiment should focus on the human hydroxylase cDNA sequence. A cDNA was cloned from the HeLa cell cDNA library and sequenced. A comparison of mouse and human cDNAs demonstrated that both sequences were very similar except for the 92bp deletion in human cDNA9. The 92bp fragment corresponds to one exon of mouse hydroxylase (Fig. 4). Humans cannot produce active hydroxylase because of this deletion. Ajit Varki and colleagues suggested that the human produces a small peptide because of the presence of a stop codon created by the deletion of the 92bp fragment10. We confirmed that a hybrid recombinant enzyme composed of mouse amino acid sequence in the deleted part of human hydroxylase and human sequence as the rest of the enzyme has hydroxylase activity9. Fig. 4　92bp deletion of human CMP-NeuAc hydroxylase gene. The comparison of (A) cDNA and (B) gene. Varki and colleagues demonstrated that the chimpanzee has Neu5Gc in its tissues. They cloned and sequenced a hydroxylase cDNA and found that the cDNA of chimpanzee hydroxylase does not have the deletion observed in human hydroxylase but is homologous to the mouse cDNA10. 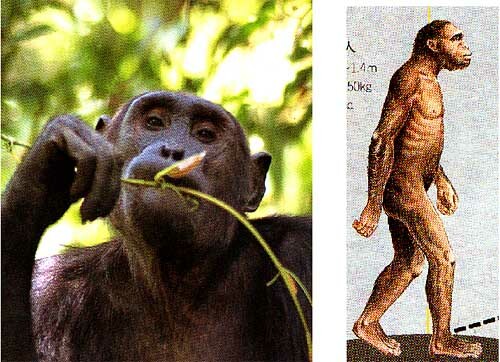 It was concluded that deletion in the human occurred after a human ancestor diverged from a chimpanzee ancestor. The 92bp deletion is one of the well-characterized sequence differences between human and chimpanzee and this difference is part of the 1.23% difference between human and chimpanzee genomes. Takahata and colleagues recently reported a molecular mechanism on how the deletion occurred. They proposed a molecular mechanism of Alu-mediated replacement based on the finding that a region containing a 92-bp exon and an AluSq element in the hydroxylase gene is intact in all nonhuman primates examined, and the same region in the human genome is replaced by an AluY element that was disseminated at least one million years ago11. Then, the question arises as to when this deletion occurred during the evolution of Homo sapiens. Varki and colleagues continue their research to answer this question. The deletion of the 92 bp fragment of the hydroxylase gene clearly indicates that the human lost the ability to express Neu5Gc-containing glycan-chains which are commonly expressed in various organs except neural cells among various mammals. Is there any relationship between the glycan-chain loss and human properties different from these of the chimpanzee? Does the loss have any positive or negative effects on the survival of the human species? Unfortunately, we cannot answer the question, demonstrating that we still do not understand the essential physiological functions of Neu5Gc glycan-chains. However, fragmental but interesting observations are accumulating. The Neu5Gc-containing glycolipid, GM3 (Neu5Gc), functions as a receptor for Escherichia coli K99 and causes severe diarrhea in piglets. Neu5Gcα2-6Galβ glycan chain is a preferential ligand of mouse CD22 molecule, one of the sialic acid recognition immunoglobulin-like lectins. The presence of influenza virus hemagglutinin preferring Neu5Gc glycan-chains is known. Myelin formation in vitro is inhibited by the induction of Neu5Gc expression in oligodendrocytes. Transgenic mice of the hydroxylase are embryo-lethal, and knockout mice of the hydroxylase exhibit enhanced secondary immune response of B cells. Neu5Gc glycan-chains are more slowly cleaved by sialidase than Neu5Ac glycan-chains. mRNA of the hydroxylase is not detectable in the brain of mammals including human, indicating that Neu5Gc expression would not be beneficial for the morphology and functions of the brain, etc. Varki speculated that the lack of Neu5Gc enabled our ancestors to expand their habitats, first, by evading various animal infectious agents in new environments of H. erectus, and second, by decreasing the infectious risk of H. sapiens from domestication of other vertebrates11. This speculation is very attractive but I think that we need to seek other possibilities. Mutations of enzymes involved in the glycan-chain metabolism are very popular as in the cases of ABO and Lewis blood groups, congenital inborn errors of metabolism of carbohydrate hydrolases, and congenital disorders of glycosylation in human. Therefore, mammals other than human would also have the possibility to mutate the hydroxylase gene, more possible if Neu5Gc was the receptor for pathogens causing critical infections because such mutations must benefit mammals for their survival. An example of Neu5Gc polymorphic variation is that Asian dogs express Neu5Gc in their red blood cells while dogs originating in Euope do not. The molecular mechanisms of this tissue-specific defect has not yet been elucidated. Another discussion is that the central nervous system acquired an unknown molecular mechanism to suppress the expression of the hydroxylase probably at the level of transcription, and this suppression is conserved among mammals including human, suggesting that the formation and development of the central nervous system from rodents to primates are supported by Neu5Ac but not Neu5Gc glycan-chains. Then, one naïve speculation follows that Neu5Gc glycan-chains are required in the peripheral nervous system or visceral organs, Neu5Gc might support function better than Neu5Ac, and some such functions are no longer required by human because of changing lifestyle and eating habits. How significant is the mutation of CMP-Neu5Ac hydroxylase gene in human for the difference between human and other mammals including chimpanzee (Fig. 5)? We are not able to answer the question at present, but the 92 bp deletion of the hydroxylase gene is a unique and interesting mutation that may help us seek answers. Researches on the functions of Neu5Gc in mammals except human and molecular mechanisms of the transcriptional and translational regulations of CMP-Neu5Ac hydroxylase will give clues to answer the question. An archeological approach to the study of Homo sapiens ancestors is another interesting subject. I believe that glycan-chains of glycoproteins and glycolipids are not essential for cells to survive but essential for individuals to survive. We must now conduct research focusing on how individuals, species, animals, plants, etc. survive on the planet Earth. Fig. 5　Chimpanzee and an ancestor of Homo sapiens who left the forests.